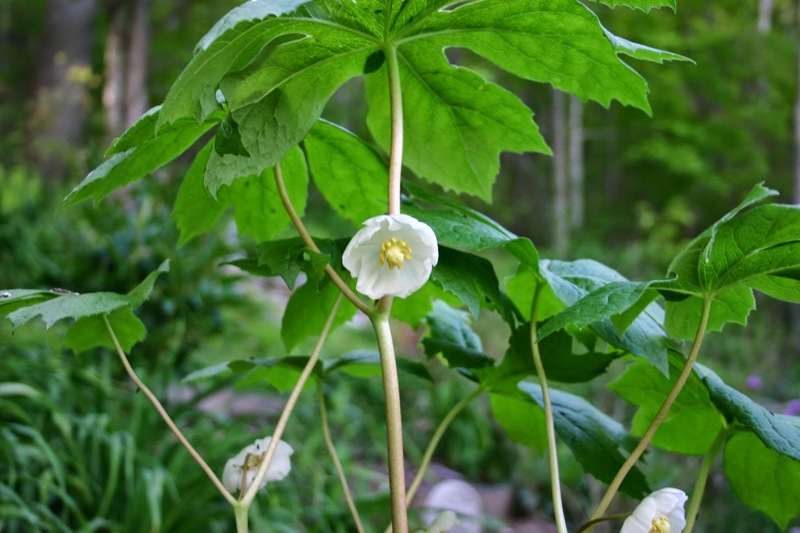 In fact, the North American Indians were familiar with may apple plant and appreciated the plant's laxative (substances that promote bowel movements, either by irritating the lower colon or by bulking the stool) properties. They used the herb to cure worms in the intestines, warts (moles) and sometimes also as an insecticide for their crops. It seems that the North American Indians had recognized the herb's toxic or noxious properties. It may be mentioned here that there are reports that some of these Indians even consumed the may apple with a view to commit suicide. May apple has a clambering rhizome or tuber that is as thin as a pencil and grows up to six feet. This part of the plant is of medicinal use and is harvested in autumn when the plants die down. Soon after harvesting, the rhizomes are dried and pulverized into fine particles. Despite being used to treat various disorders that range from liver problems to cancer, may apple is still best known for its advantages as a laxative. However, the Food and Drug Administration (FDA) in the U.S. has listed the use of may apple as ‘unsafe' owing to its potent purgative (a substance used for removal of bowels) measures. The may apple root and plant contain valuable constituents Quercetin, Kaempferol, Podophyllin, Isorhamnetin, Gallic-acid, Berberine, Alpha-peltatin, that are being studied for their healing, anticancer and other properties. The root is used as a medicinal herb, it is antibilious, cathartic, cytostatic, hydrogogue and purgative, it should only be used by professional Herbalists. It is a most powerful and useful alternative medicine. A possible treatment for cancer is being tested as it contains podophyllin, which has an antimiotic effect (it interferes with cell division and can thus prevent the growth of cells). 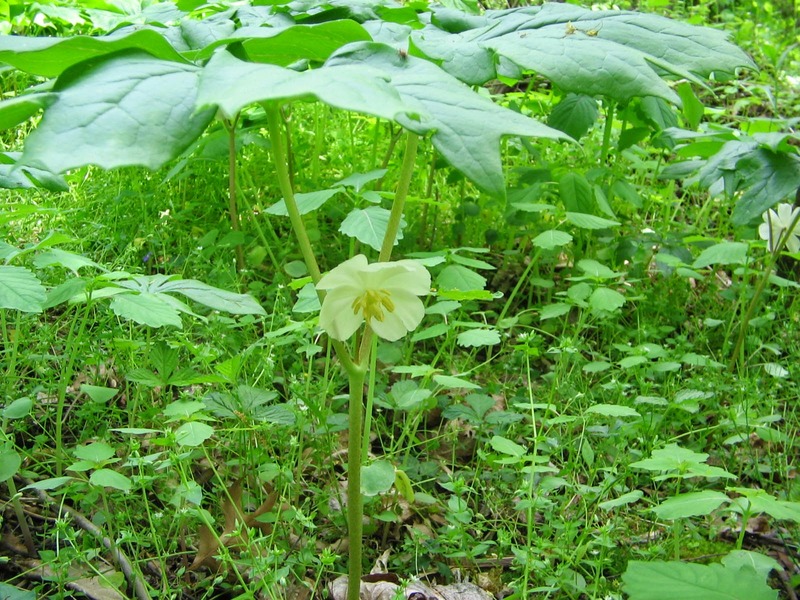 May apple (Podophyllum Peltatum) is a medicine of most extensive service; its greatest power lies in its action upon the liver and bowels. It is a gastro-intestinal irritant, a powerful hepatic and intestinal stimulant. In congested states of the liver, may apple is employed with the greatest benefit, and for all hepatic complaints it is eminently suitable, and the beneficial results can hardly be exaggerated. In large doses may apple produces nausea and vomiting, and even inflammation of the stomach and intestines, which has been known to prove fatal. In moderate doses, it is a drastic purgative with some cholagogue action. Like many other hepatic stimulants, may apple does not increase the secretion of bile so much when it acts as a purgative. May apple is a powerful medicine exercising an influence on every part of the system, stimulating the glands to healthy action. It is highly valuable in dropsy, biliousness, dyspepsia, liver and other disorders. Its most beneficial action is obtained by the use of small doses frequently given. In such circumstances, may apple acts admirably upon all the secretions, removing obstructions, and producing a healthy condition of all the organs in the system. In still smaller doses, it is a valuable remedy in skin diseases. Ancient records show that the American ethnic groups also drank a ferment prepared from the dehydrated and crushed rhizome or tubers of may apple as a medication to cure worms in the intestines. They also used the substance as a remedy for snakebite as also as a laxative to clear bowel movements. American Mandrake, or May Apple, is medicinal and edible (fruit), used extensively by Native Americans. The fully ripe fruit is eaten raw, cooked or made into jams, jellies, marmalades, and pies. It is very aromatic, and has a sweet peculiar but agreeable flavor. May Apple seeds and rind are not edible, said to be poisonous.